When it comes to the fatigue and frustration of thyroid problems, understanding and addressing the underlying causes of imbalance is the missing factor in getting your health and your energy back on track and keeping it that way. These underlying causes of thyroid dysfunction- the root causes- are just what they sound like: the basic malfunctions in the body that are ultimately driving the imbalance in your hormones. 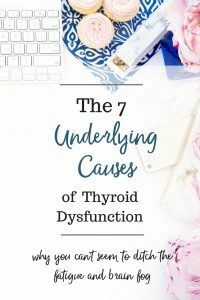 I’ve identified 7 underlying causes of thyroid dysfunction, that create a vicious cycle of chronic inflammation, which is THE root cause of all chronic disease. Inflammation is an immune response to any type of threat to the body. The swelling and redness you experience when you cut your finger are signs of acute inflammation. Immune cells congregate at the site of injury and create the telltale signs of inflammation as they go to work combating infection and paving the way for the healing process to begin. Chronic inflammation, on the other hand, is a state of hyper-vigilance on the part of the immune system due to an ongoing assault from sources such as inflammatory foods, toxins and stress. Again, this inflammation is THE root cause of chronic disease, including thyroid problems, so the most pressing goal for anyone wanting to support their thyroid health is to eliminate chronic inflammation by addressing the following 7 causes of hormone imbalance. Let’s take a look at each one. Food sensitivities, also known as food intolerances, ​result from eating foods which irritate the immune system and incite an inflammatory response. While food allergies might come to mind, intolerances are not quite the same thing. A true allergy results for consuming a food which signals the release of IgE immune antibodies. When the offending food is consumed, this immune response causes swift and often, severe signs of allergy, such as watering, itchy eyes, hives, swelling of the lips, tongue or face, difficulty breathing and sometimes, anaphylactic shock. Food intolerances on the other hand, stimulate a different type of immune response. Eating foods to which you have developed a sensitivity sends IgG antibodies into high alert. These antibodies produce a much more subtle type of reaction, from fatigue to digestive issues. Because the response to eating these foods is not immediately noticeable, it’s often difficult to pinpoint which foods are causing a reaction. Food sensitives often develop in those with leaky gut, another underlying cause of thyroid dysfunction which we will look at next. When you suffer from leaky gut (and anyone with thyroid dysfunction most certainly is), proteins from the foods you eat can cross the damaged gut barrier and incite an immune response (inflammation). Food intolerances can be diagnosed through a blood test or a skin test. It is important to note, however, that sensitivities can develop at any time and are only addressed through repairing the gut. Foods that are commonly associated with intolerance are dairy, legumes, eggs, grains, nuts, beef, chicken, lamb and pork. Signs of food intolerance: fatigue, bloating, heartburn, indigestion, skin issues such as eczema, irritablity. When the lining of the digestive tract becomes damaged through infection, inflammatory foods or toxins, it can become “leaky”- full of holes that allow toxins, undigested food particles and bacteria a free pass into your body. Waiting just on the other side of your gut lining is the innate immune system. When those offending agents cross a leaky gut barrier, they run right up against the immune cells whose job it is to protect you from these foreign invaders. That’s right, they respond to these threats in an immune attack which creates inflammation. Now, imagine eating inflammatory foods, swallowing toxins through the plastic packaging your food comes in contact with, through pesticides, and living a stress filled lifestyle day in and day out, also a contributor to leaky gut. It’s a recipe for chronic inflammation if there ever was one. Repairing a leaky gut is foundational to supporting thyroid function and improving energy levels and is Step 3 of the Thyroid Fix Roadmap. Leaky gut often goes hand in hand with dysbiosis, an imbalance of the gut microbiome, which we will look at next. Signs of leaky gut- allergies, autoimmune disease, eczema and other skin issues, digestive problems, arthritis. Many women are unaware that latent infections in the body are at the root of their hormonal woes. SIBO (small intestinal bacterial overgrowth), for example, is a disruption in the type and amount of microbial flora in the digestive tract. This imbalance in the microbiome leads to further damage to the gut lining and multiple nutrient deficiencies which are sure to result in fatigue and cognitive issues such as depression and anxiety. H. pylori is another common infection associated with thyroid problems. This nasty bacterium lives in the stomach, burrowing into the lining and dampening the production of stomach acid. This can lead to protein malabsorption, nutrient deficiencies and problems like fatigue and bloating- and, of course, inflammation. Not all underlying infections are in the gut, either. Dental infections have been linked to thyroid problems, autoimmune disease and cancer. Viruses like Epstein-Barr are often associated with impaired thyroid function as well. When your efforts to support your thyroid through diet and other lifestyle interventions fall flat, It's worth investigating if latent infections are undermining your hormone health. These infections are usually diagnosed through a stool test in the case of gut infections, or through blood tests. Signs of underlying infections: fatigue, joint pain, bloating, gas, belching, hair loss, rosacea. Your body requires certain key nutrients in order to synthesize your thyroid hormones, including iodine, selenium and zinc. When you aren't consuming enough of the nutrients your thyroid can’t adequately produce the hormones needed to maintain your energy levels. Other nutrients associated with mental health and energy production are the B vitamins, vitamin C and magnesium. While poor diet is often associated with nutrient deficiencies, it’s equally important to address the body’s ability to absorb those nutrients. As we’ve learned from the underlying factors already examined, a leaky gut and latent infections can impair your ability to absorb key nutrients. 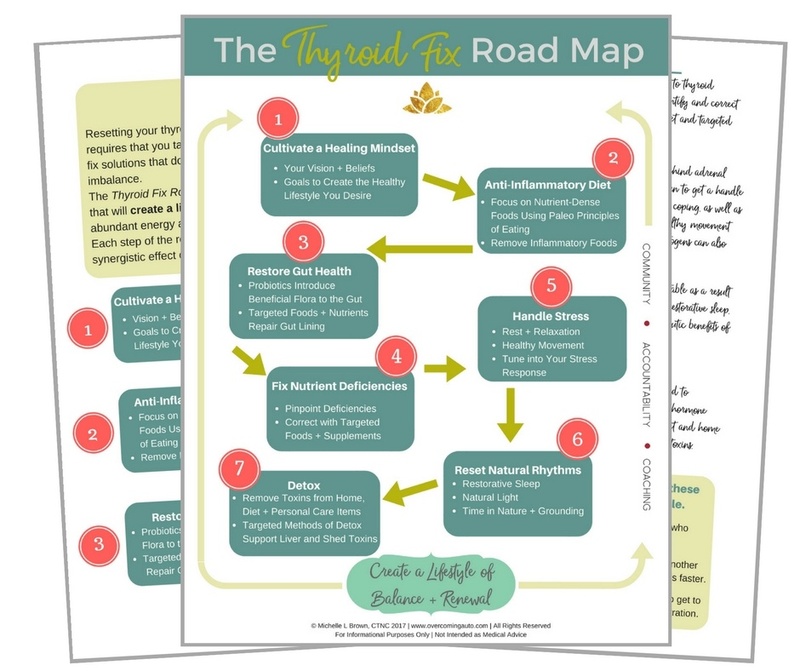 Addressing nutrient deficiencies is so important to regaining your energy and supporting your thyroid health, that it gets its own step on the Thyroid Fix Roadmap. While eating a nutrient-dense diet and restoring gut health will make major strides towards restoring your nutrient profile, supplementation is helpful at this point to support thyroid and adrenal function, as well as for improving immunity and detoxification. Top nutrients to supplement with include Vitamin D, vitamin C, vitamin B12, magnesium, selenium and zinc. Top signs of nutrient deficiencies: fatigue, dull, dry skin and hair, thinning hair and weak nails. Sugar is, simply put, one of the most inflammatory foods around. Consuming refined sugars creates a spike in insulin levels, which in turn spike cortisol, the resident stress hormone. Chronically elevated levels of cortisol can also deplete your body of key nutrients, such as magnesium chromium and vitamin D.
Elevated cortisol levels are also associated with inflammation and is the hallmark of adrenal fatigue. Even more alarming, cortisol has a nasty habit of pulling your other hormones out of balance as well, including thyroid hormones and estrogen. In my article on blood sugar imbalance, I share how unregulated cortisol can even decrease your fertility. Signs of blood sugar imbalance- craving sugar and refined carbohydrates, irritability, especially when meals are missed, weight gain around the abdomen, difficulty sleeping, depression and mood swings. From your favorite cologne to the plastic in bottled water to heavy metals in your makeup- toxins are everywhere these days and they are one of the top reasons why women are struggling with hormone imbalance at an unprecedented rate. Chlorine is a toxic chemical commonly added to our water supply in the name of sanitation. Unfortunately, chlorine can interfere with your thyroid's ability to absorb and utilize iodine, a nutrient necessary for the production of thyroid hormones. Nitrates are another group of toxins that are especially hard on the thyroid. Used as a preservative in processed meats like hot dogs and bacon, nitrates have been shown in studies to block absorption of iodine, and have even been linked to thyroid cancer. Nitrates are also found in fertilizers and often end up in our water supply due to run off from industrial farming practices. There are quite literally hundreds of toxic chemicals in your environment that can derail your hormone health, impair liver function and incite the inflammatory response. It pays to start paying attention to what you are putting in and on your body, reducing your toxic load whenever possible. Signs of toxic overload- acne and dull, dry skin, fatigue, coated tongue, yellowish tint to eyes, gas and bloating, body odor. According to the American Medical Association, stress is a factor in 75 percent of all illness, while the Agency for Research on Cancer and the World Health Organization concur that 80 percent of cancers are due to lifestyle factors. In other words, stress is killing us. Stress and toxic thinking don’t just affect the mental realm. They also affect us on a physical level, raising cortisol levels and even changing our DNA. Stress is also a factor in leaky gut- it signals the tight junctions of the gut lining to become more permeable. Stress is often overlooked as a factor in chronic health issues, yet so vital that dealing with your mindset is the first step of my Thyroid Fix Roadmap- and we visit it again in Step 5 when we address techniques such as rest, relaxation and healthy movement. Signs of stress- fatigue, difficulty sleeping, difficulty concentrating, aches and pains, headaches, anxiety or depression. 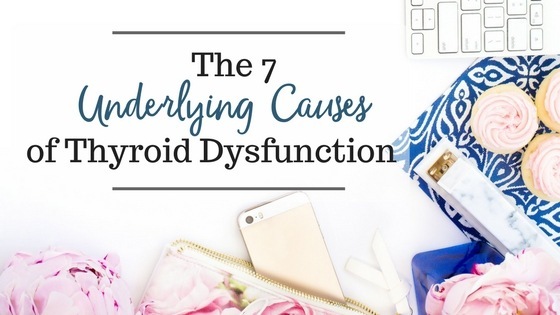 The good news is that each of these 7 underlying causes of thyroid dysfunction can be addressed by improving key lifestyle factors, such as choosing an anti-inflammatory diet, removing toxic chemicals from the home and getting movement and natural light each day. The Thyroid Fix Roadmap is a 7 step guide to systematically address the underlying causes of hormone imbalance and fatigue. It takes the guess work out of keeping your thyroid healthy so you can regain your energy, experience improved moods, sleep better, and stay healthy for life. 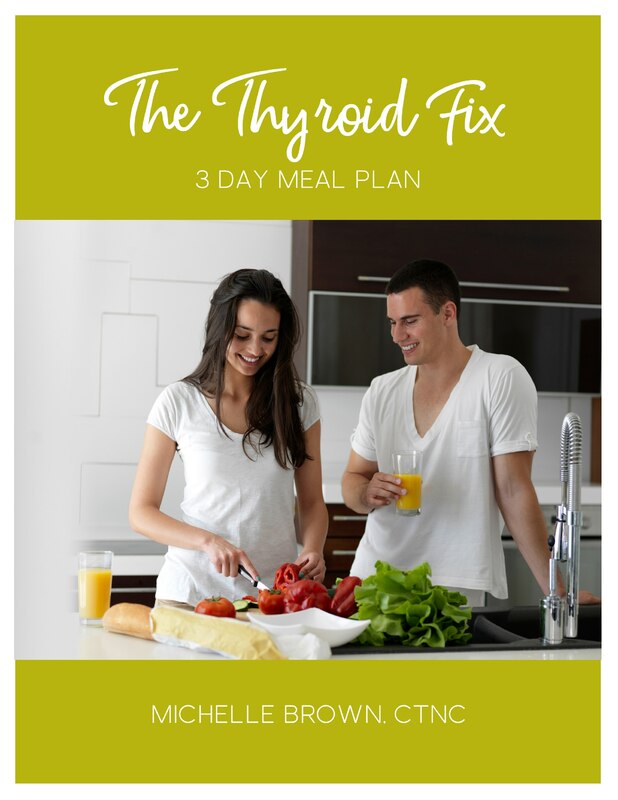 You can download your Free copy of The Thyroid Fix Roadmap below.